Events • PSPOs • Take action! The weekend of 6–7 August will be a national weekend of protest against ‘public spaces protection orders’ (PSPOs), blank-cheque powers which allow local authorities to ban all kinds of activities in public spaces. We will be carrying out protest actions – big and small – to sound the alarm about these unaccountable and draconian powers, which are leading to absurd new criminal offences across the country. We will stand in groups of two in Hillingdon, to protest against the council’s ban on ‘standing in groups of two or more unless waiting at a designated bus stop’. We will be holding a ProtestPSPO festival in Hackney, where the council was forced to withdraw an order banning rough sleeping and loitering. We are calling on the council to ‘keep Hackney PSPO-free’ and for other councils to follow Hackney’s lead and scrap their PSPOs. The festival will be an afternoon of speeches and music. You can bring an item that has been banned by a PSPO, such as a remote control car (banned in Hillingdon), chalk for pavement art (banned in Swindon), a bicycle (banned in Bedford centre), or a head covering (banned in Sefton). 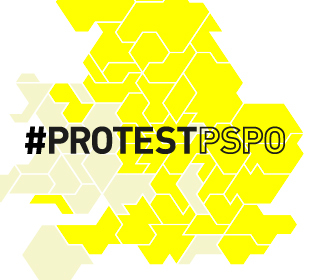 See the #ProtestPSPO website for full details.